Getting back into the daily grind can be pretty damn hard after a fun-filled weekend of anything and everything. Luckily, Sydney is a city that never actually stops with the shenanigans so FYI, you’re going to be pretty bloody busy this week. Expect el cheapo movies, a natural wine masterclass and a pretty hectic truffle festival. If you thought you’d be laying low this week, think again. Here are 5 fabulous things to do in Sydney this week. To celebrate the launch of their new rewards club, for one week, Palace Cinemas will be slinging super movies for a fiver. See the new Mission Impossible or sing your heart out to Mamma Mia: Here We Go Again all for five bucks. We’re not complaining. Grab tix here before they all go. This week, you’ll be unleashing your inner Da Vinci and Van Gogh. Grab your pals and a bottle of wine (it’s BYO) and head to Cork and Canvas for a boozy art night. 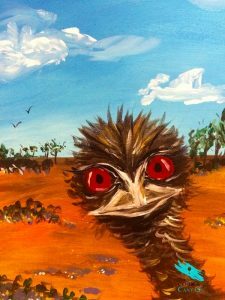 Lead by professional painters this two-hour paint and sip will have you painting an Aussie outback masterpiece Emu and all. Take it home and show your mama (she’ll definitely stick it on the fridge). Booking rightttt here. A masterclass dedicated to alll things wine. You know what to do. NOMAD’s wine masterclasses take a closer look at a specific theme of wine. Throughout the evening you’ll get the chance to sample drops of eight vino. What goes with wine? Yep you’re right. Cheese and charcuterie will also be on the menu. What more could you want? Head here to book. Sadly truffle season is almost over. So, we’re going to use these last of the season to get a hold of as much of the delicious morsel we can. The great people at Mode Kitchen and Bar are here to help us on our quest for truffles. They have created two truffle menus and a range of truffle infused cocktails. Choose between the Truffle Tasting menu (a three-course affair) and the Truffle Table (a four-course menu and private talk from head chef Francesco Mannelli). Both degustations highlight the unmistakable flavours of fresh Aussie truffle. Dare to be brave and try the Truffle Espresso Martini or Black & White Negroni. Head here to book. Grab your date, or your work wife and head to Juanita’s for Cheese, Whisky and Wine. We know, it’s a solid foodie trifecta that we’ll never get sick of. What else do you need to get through the mid-week blues. Nibble on tasty morsels from the tasting board while you cosy up in front of the fireplace. Pair the nibbles with your choice of whiskey or red. Head here to book. * EMUsme was the feature painting for our public paint session held at our Sydney C&C studio located at 106 Oxford Street, Darlinghurst on Monday, 13 August 2018.